At the end of the year, in December, President Woodrow Wilson became the first United States President to travel to Europe while holding office for the purposes of participating in the Paris Peace Conference. Also during this time Iceland regained its independence, the British military government in Palestine began, and Serbia finally annexed Montenegro. In this section, you will also learn about a number of fascinating events that happened across the lumber industry, too. Specifically, you will gain additional insight into the challenges that the Southern Pine Association was facing in terms of branding and trademarking lumber. It was quickly discovered that, because no two brands or other items of lumber are truly identical, grading could never be an exact science. You will find out about how many mills outright refused to support this movement unless it benefited their particular circumstances with regards to defeating their competition. You will also learn more details about a modification of the Sherman Act that couldn’t have come along at a better moment. We hope that you continue to enjoy the journey you’re taking through this industry’s history and that it is every bit as enlightening and eye-opening as you want it to be. 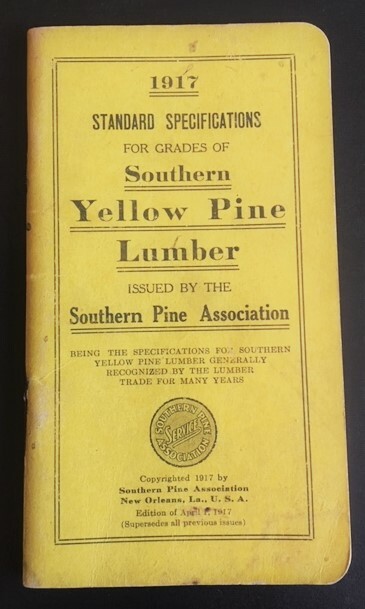 The thought was advanced that the branding of lumber could not be undertaken by the Southern Pine Association because it would have monopolistic phases. Actually, it was intended to be used as a leader in connection with advertising and publicity for the purpose of promoting use and sale of merit grades of southern pine. Whether from sources fearing a repetition of the legal difficulties of the Yellow Pine Manufacturers Association of prior years, or to purposely delay an industrial movement, or because branding by all subscriber mills did not lend itself to proper control, is not known. Advice on good authority started no legal objections to the Southern Pine Association recommending to its subscribers that they brand the lumber produced. Individual mills continued to brand, as, when and if they so desired. The Cypress Association had an invested capital of about $100,000 in the development of the practice of branding and would have discontinued, because of difficulties in securing full mill cooperation, if they could have eliminated the effects of publicizing reasons for the preference of their brand over all others. Fundamentally, however, it appears that the mills refused whole-hearted support in the movement unless it benefited their particular circumstances in defeating competition. The idea and intent of organized endeavor was proper and sound, but the mill units confused each particular situation deliberately for their own advantage or the others’ disadvantage. Branding or trade-marking with an appropriate Southern Pine Association symbol of grade was at a temporary impasse. No two boards or other items of lumber being identical, the grading of lumber could never be an exact science. Any one grade, however, was susceptible to uniform interpretation and consistent application in manufacturing and merchandising. Trade promotion and advertising, the logical working tools of merchandising was expanded. The SPA Inspection Department, while admitted to be imperfect, was accomplishing careful supervision of grades at mills through instruction and supervision by Association inspectors. Influences, for money profit reasons, continued to operate against the maintenance of standard grades – but the subscribers to the Southern Pine Association, realizing uniformity in the grading of southern pine to be of advantage to manufacturers, distributors, and the ultimate consumers, collectively endorsed the Association’s efforts in this regard. They further recommended the holding of district meetings of mill graders, and advised that subscribers authorize their graders to attend these conferences in cooperation with the Inspection Department for their education and improvement of grading ability. Modification of the Sherman Act to allow industry to combine for the purpose of protecting itself against any concentration of purchasing power, was sought. Referendum Number 17, recommending revision of the Sherman Act to permit cooperative agreements under governmental supervision among industries dealing in natural resources had for sometime been supported by the business interests of the country. A broader improvement of the Sherman Act than was contemplated in the referendum was now desirable, because of the successful result of cooperative effort within industry during the war. A resolution to this effect was passed at the Reconstruction Conference in Atlantic City at the December meeting. The Webb-Pomerene Act providing the authority for operating combinations in foreign trade resulted in the organization of companies for the collective selling of southern pine mill products for export.